The "WHAT" of leadership and management performance! Profiling the mind abilities, the mind talents of an individual in a leadership or managerial position. 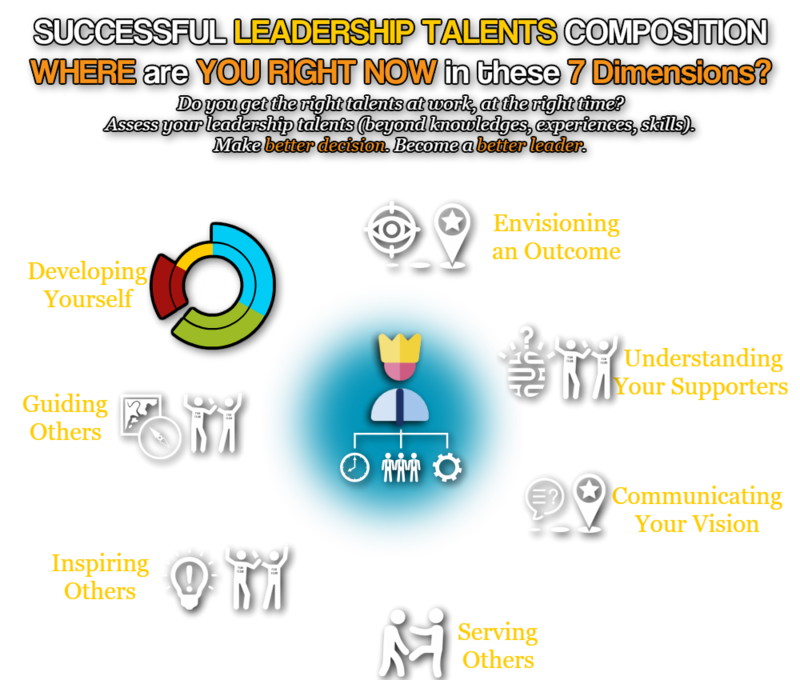 Below, a description of the 7 talent dimensions needed to lead. For managerial roles, it's a bit different. Please note that each dimension is a composition of several mind talents. Envisioning an outcome: leading begins with realizing and clearly envisioning the overall mission to accomplish. A mission is what is going to happen, not how. Understanding your supporters: understanding how your vision satisfies people's needs is crucial to engage them. You must know what changes others are receptive to and ready for. Communicating your vision: in order to engage people to follow, you must clearly communicate your vision to them. Serving others: people will not chase a difficult dream for very long unless they think it supports their own personal goals. You must insure that people connect both your vision and your actions with their own personal goals. Inspiring others: embarking on difficult and uncertain journeys requires a special kind of energy in order to continue for the long term. Inspiration draws forth that special energy that can only come from the individual. Guiding others: in taking action and moving forward the completion of your mission and vision, there will inevitably be surprises and unexpected results. A person skilled in leading will continually assess the plan for achieving the stated goals and make course corrections along the way. Developing yourself: in order to understand, motivate and lead others, you must first understand yourself. Leaders must practice what they preach and be able to see and develop themselves before they can do so for others.